As an integral part of the ERITECH® SYSTEM 3000, the screened, insulated ERITECH® ERICORE downconductor conveys the lightning discharge current to ground with minimal danger of sideflashing. 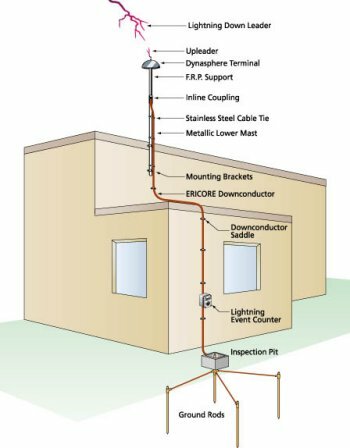 The ERITECH downconductor evolved after extensive studies of potential voltage rise in structures due to lightning injection. This cable is comprised of carefully selected dielectric materials, which create capacitive balance and ensure insulation integrity under high impulse conditions. Designed as an integral part of the ERITECH SYSTEM 3000 Lightning Protection System. The ERITECH downconductor cables are low inductance, low impedance cables designed to minimize voltage build-up due to lightning impulses. This cable provides significantly higher performance than any normal HV cable and is specifically designed for the control of lightning impulses. The photo at the above left shows the high voltage upper ERITECH ERICORE termination. The correctly rated termination of the ERICORE is critical, as this is the point of greatest voltage build-up. The new ERITECH ERICORE upper termination, therefore, has a tested 50% engineering safety factor built-in to ensure reliable operation under the harshest environments. For application advice, please contact us.